Day 15. 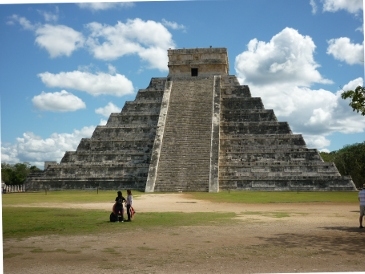 The jewel in the crown of Mexico’s Piles of Rocks is the pyramid at Chichen-Itza, two hours out of Merida, and we were guided by the very able Manuel Jesus Gonzalez Mendez. First off, he showed us a gum arabic tree. Apparently, when the Spanish arrived in Mexico, they were shown this tree by the Mayans who stripped off the bark and said, “Chick-Le,” which means “chew with the mouth”. We’re guessing that’s where the chewing gum “Chicklets” got its name. We were shown the largest “ball game” court in Meso-America where the Mayans played their sacred sport using a rubber ball. Lining the court were pictures of priests sporting what looked like bluetooth headsets. Could these “priests” really be aliens from another world wearing communications devices? 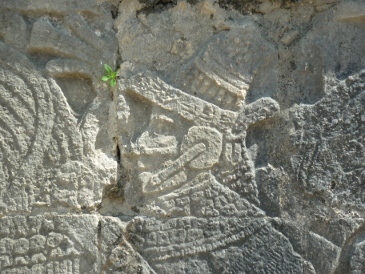 Further round was a carving of a king appearing from the mouth of a serpent, one of the most sacred Mayan gods. 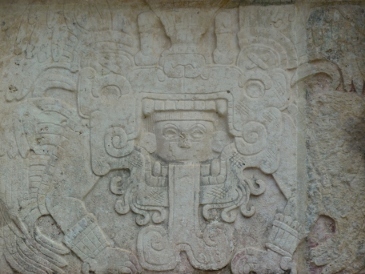 Could this actually be a carving of the king peering out of a window in his spaceship? Half-way round the tour, we were shown a sacred well of the Mayans, 23 metres down and 60 metres deep. After yesterday’s Cenote experience, we thought it might be nice to have a refreshing dip to cool off, but then we were told that a few months ago, three Canadian tourists jumped into the well and couldn’t get out again. The fire brigade had to be called to rescue them. 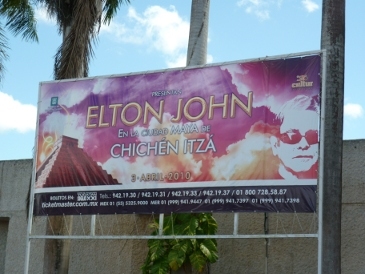 After the tour of Chicken Pizza, we caught the bus to Cancun. The bus was late so Annie took the opportunity to teach our compadres, Jodie, Val and Justine, some Kung-Fu Yoga Moves. Captain Sulu kindly gave up piloting the U.S.S. 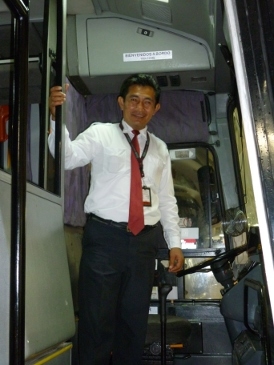 Enterprise for a day to cart us in his bus to Cancun. Perhaps he too was looking for a bit of nightlife. Cancun is the Blackpool of Mexico but not quite as nice. We took the opportunity to sample the nightlife and witness the mating behaviour of American college kids on tour. Our chosen waterside nightspot was Señor Frog complete with indoor water-slide. Getting there was as interesting as the nightclub itself. We had a run in with a lying cheating dirty scoundrel Taxi Driver who wanted twice as much as we’d agreed after dropping us off. Safe called his bluff and said he’d call the police … unfortunately the taxi drive kindly obliged and called the police himself. After a bit of gentle shouting and T-shirt pulling and no help whatsoever from the policia, we settled unamicably. The encouter with the taxi driver was fun (mainly because no one ended up in jail) and confirmed our suspicions about Cancun. 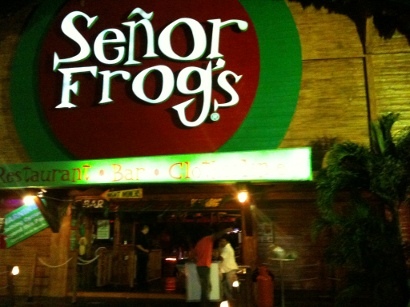 Señor Frog was a spectacle, a mix betweeen a disco and a game-show. The highlight was the Frozen T-shirt Contest. While standing half naked on the stage, the contestants had to down their beers then unfreeze a T-shirt sufficiently to be able to put it on as quickly as possible. The crowd jeered and the waiters poured shots into punters’ mouths from a communal bottle. Nice! Very impressed with the beautiful photos.. they are a great representation of “Mehico” . It seems from the Yoga picture that our Annie is the one who had gained the most from the practice..!! I am more fascinated by the writers commentaries, I think it should be compiled one day into a book ? The Pyramid is Magnificent, is it similar to those in Gizza ..? connection but certainly the goat has Egyptian blood !!? The pyramid is very impressive though smaller than those in Giza. Like the pyramids at Giza, is was built “mathematically” … the sides are aligned exactly with the points of the compass, the sides slope at exactly 45 degrees, and the light shines on it in a special way at the spring equinox and at the summer solstice.